if you follow me on twitter you will know that on Saturday i went to my friend's sister's 18th birthday party! i had a great time, and just thought i'd show you what i was wearing! sorry about the picture quality, i didn't take my camera so it had to be taken on my blackberry! I know some of you may think its bad i'm wearing all black but i just can't help it haha! i have so many black clothes because they literally go with everything! i would say black is my favourite colour to wear! 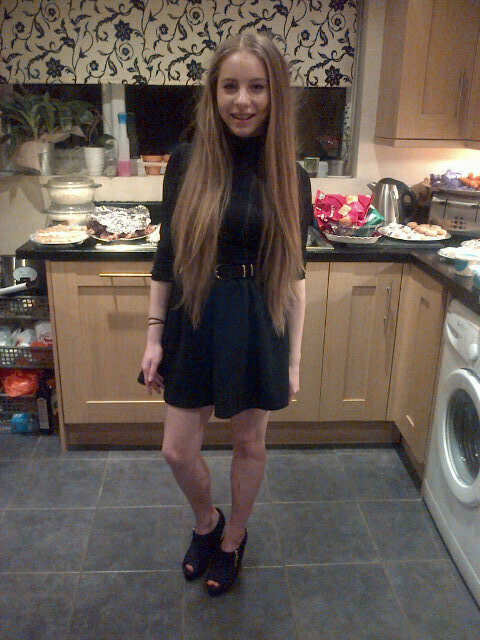 i also really like my hair in this picture (only because it looks long-ish ha ha!) but i will be getting it cut soon.. wah! anyway.. the belt im wearing was featured in my recent haul and my shoes were featured in a not-so-recent haul! So that is all for outfit of the night, thank you for reading! 54 comments on "ootn #1"
You look stunning! Your hair is sooo beautiful and long! :0I really like the skater skirt! I've been looking for one for ages! may I ask , how much was it? The shoes are very chic! i love your hair! such a cute outfit. Your hair is amazing! You look lovely! Love your outfit, your soooooo pretty! your hair is adorable! Your hair is amazing! and I love the outfit! Oh my gosh your hair is amazing! Amazing outfit! Also, your hair looks incredible!!! OH MY LORD GIVE ME YOUR HAIR. I am aware that this is probably the 999th message regarding your hair.. but seriously... give it to me!! !